It was hard to avoid Margiela chatter on the final day of shows at LC:M, and so even the reliably extravagant Burberry show experience had to play second fiddle to the return of John Galliano. All the brand’s tried-and-tested hallmarks were in place from the megawatt-power front row, to the live music, to the personalised welcome email which is sent to every guest from chief executive Christopher Bailey. 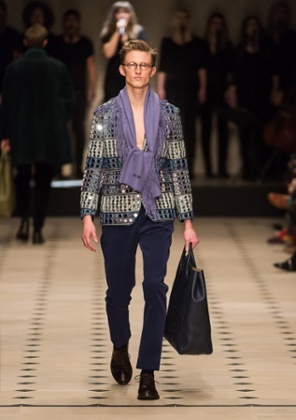 As is customary at a Burberry show, the finale was choreographed to be Instagram-friendly. This season, it rained silver-cellophane confetti, providing a photogenic image to resonate around the world seconds after the show finished. This level of commercial might requires a whimsical element to stop the subliminal message being read as bombastic. A balance that Christopher Bailey, as both chief executive and head designer, understands only too well. The show’s title was Classically Bohemian, and as Bailey explained backstage the show was about the contradiction of two different worlds. “I wanted something that was conventional mixed with something off-kilter and bohemian.” He could have been referring to his two distinct, yet overlapping, roles at the company. 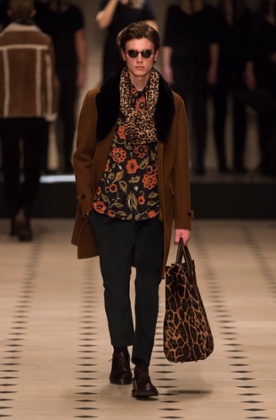 On the catwalk, this translated as formal shapes and classic silhouettes mixed in with floral prints, fringed suede bags, leopard-print topcoats, shearling and gap-year mirrored embroidery. In theory it sounds like it might have been lost in a fog of cheap incense sticks, but the quality and cut provided the essential element of modernity and luxury. “I like the idea of something that is decorative and transports you away to somewhere else,” he said. Earlier in the day, the spotlight was fixed on Craig Green, universally seen as the boy wonder of British menswear right now. 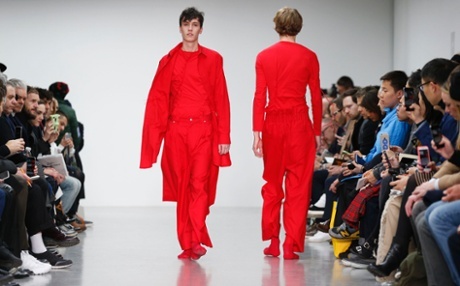 This was his second solo show at LC:M through the Newgen initiative, and following – as this did – a show last season where several otherwise sensible fashion editors were moved to tears, the pressure was on. Green chose to handle that pressure by continuing themes he has already began to explore rather than performing an abrupt about-turn. He focused on uniform but as he explained backstage “the less brutal, more vulnerable and romantic side of it”. This meant models wearing a silhouette that was tight at the top worn with wide-leg parachute pants, which were swiftly termed “trance pants” because of their similarity to the trouser shape worn at raves in the early 1990s. The colour palette was restrained – bottle-green and bright red proving the foil to black and white – which the designer termed “classical colours”. The result, shown again without shoes to ramp up the feeling of vulnerability was a show of quiet confidence. A calm response to the hype around the designer, who was again showered with critical acclaim. 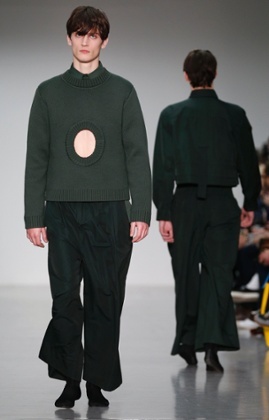 Immediately after the show, there were already mutterings within the industry about the possibility of the undeniably talented Green turning his hand to womenswear.